We are sure you will enjoy this Irish joke, we are still laughing while writing this post. 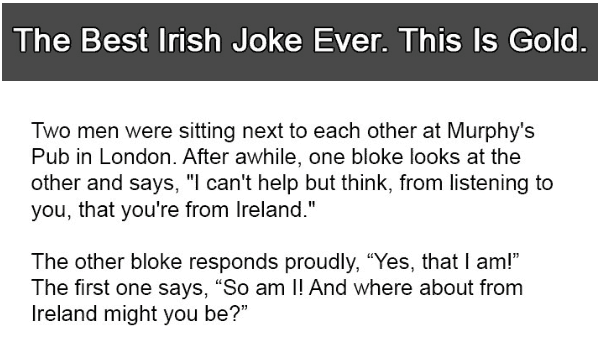 This is our first entry to our Irish jokes section. The exact source of this Irish joke can’t be determined. We will have a lot more coming on a weekly basis. Be sure to join our mailing list to get a weekly update. Two men were sitting next to each other at the Murphy’s Pub in London. After awhile, one bloke looks at the other and says ” I can’t help but think, from listening to you, that you’re from Ireland?”. About this time, Vicky walks up to the bar, sits down and orders a drink.